As an Australian born during the later years of the Vietnam War, I grew up with constant references to our national involvement, both at school and publicly. Each year, on ANZAC Day and Remembrance Day in particular, the stories of this war and the losses endured have become part of our national fabric. My husband gave us a quick refresher course on some of the important points of this war prior to this trip, so we were both really looking forward to visiting here. Where are the Cu Chi Tunnels? Located 70km north west of Ho Chi Minh City lies the district of Cu Chi, home to a vast network of underground tunnels used during several wars fought in Vietnam. The Cu Chi tunnels address is given as TL15, Phú Hiệp, Hồ Chí Minh, 733814, Vietnam. This is not entirely helpful however as there are two tunnels in Cu Chi and this address will only lead you to one of them. This area is now one of peace, a place where everyday lives have returned to normal following the devastating impact of the Vietnam War on this area. It has a rural, small village feel about it. Where shopkeepers sit out the front of their stores, directing visitors to the correct bus and hoping to sell a bottle or two of water. Where women walk up the road with a basket and return with it full of leafy greens, having foraged on the side of the road. Motorbikes towing pigs in cages share the road with farm trucks. There are two areas where you can see the tunnels, Ben Dinh and Ben Duoc. We chose to go to Ben Duoc as they are the best example of the original tunnels. Ben Dinh still has tunnels but they have all been widened for tourism purposes. However, my mission was clear! If I was coming all this way to see the tunnels, then I wanted to see exactly how they were all those years ago when the Viet Cong used them as part of their strategy. 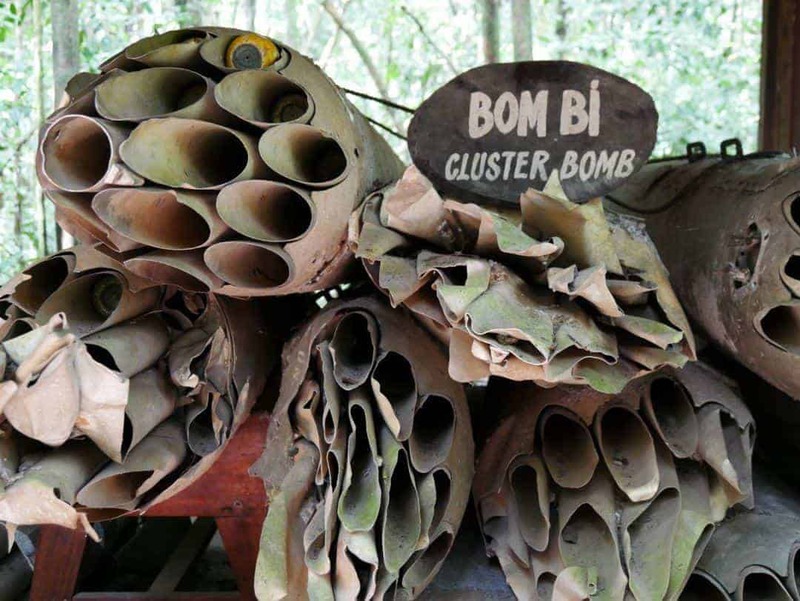 The Cu Chi tunnel complex is northwest of Ho Chi Minh City, in an area that was of strategic importance to both North Vietnam and the US. In this area, approximately 120km of the overall network exists. Visiting here is one of the “must-do” activities on any visit to Ho Chi Minh City and for good reason. 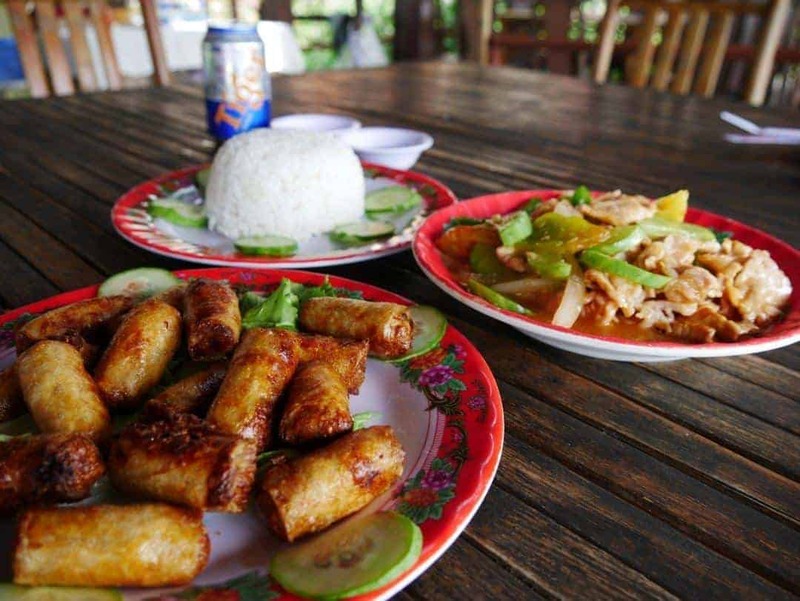 One of the advantages of coming to Ben Duoc is that the crowds are usually less than in Bin Dinh. We had a quiet day, with only about 10 people here at the time of our visit. Directional signage is not a strong point at the entrance but we found a hut which turned out to be the ticket office. Ticket prices are two-fold, 70,000 VND for the entrance fee and 20,000 VND for the guide. You cannot choose to go without a guide as this is mandatory for access into the tunnels. Besides, at around AUD$4 and AUD$1 respectively, I don’t think it’s a problem anyway. At the commencement of the tour, a video is played. It’s old so expect that the quality of both picture and sound is not to 2016 standards, but it serves as a good starting point. This was the part however that I found the most interesting. Perhaps I hadn’t thought enough about it, having always had the Australian perspective in my head? Maybe it is that I have had only fleeting real experiences with the communist ideologies? Or perhaps it was because it was propaganda at its best, making light of an ugly war, in which all sides had heavy losses and ongoing impacts that can never be properly understood or imagined to those who weren’t there? As images of local women laughing and dancing played, having fought the enemy that day, appeared on the screen I felt uncomfortable. As the soldiers gambled and had fun, and the words in the video referenced them “being heroes for killing Americans”, and “there was always some way to kill Americans”, I squirmed in my seat. Whilst I have no doubt that opposing forces may have made similar comments, I have never seen this war glorified like this. The hatred for American forces was still tangible. There was no mention of any other country in their fight against North Vietnam. I expected a different perspective, of course. I didn’t expect sympathy towards the US but I expected a conversation about the impact of the war to those who fought and survived, and to those who had to learn to live again in a changed country. I’ve sat through countless videos, reproductions and stories from the side of Nazi Germany during the world wars, and listened to stories from different sides. And whilst they were cruel and had their share of propaganda, I’ve never seen anything quite like this. Highly strategic and incredibly clever, the tunnels were the way for the Viet Cong to continue their fight to secure southern Vietnam and at the same time to halt their “enemy”, the Americans, from taking Saigon (now Ho Chi Minh City). Interestingly, the first tunnels of this 250km network were dug in the 1940s when the Vietnamese fought the French to end their colonial rule. It was during the Vietnam War, however, that three levels of tunnels were dug, going down as far as 10 metres underground. As those fighting against the North Vietnamese armies amped up their fight in the air, these tunnels became homes for many of the locals. Having now been inside a few of these tunnels, I cannot even begin to comprehend how they lived here. In the deeper tunnels, they were safe from air strikes, but they could only stay for one hour due to a lack of air! There’s a reasonable distance to walk from the ticket booth to the commencement of the tunnels. Along the way is the memorial to nearly 50,000 Vietnamese who fought and died on these lands in both wars. Once you pass through the memorial grounds, an open-air museum provides some physical insight into the weaponry used during the war. Here’s one of our tour group getting into the small tunnel. Entry is by lowering yourself in, feet first, on the diagonal. It’s a bit tricky and is a testament to the size of those who used these tunnels. This is my husband, who is 6 foot, creeping along the tunnels in a hunched position. It was quite tight in some areas for him. Throughout the trails, there are various bunkers such as these, used as viewing points or covert attack positions. The US army conducted an extensive air campaign during this war. This is just one of the examples of where a bomb from a B-52 landed, providing a further understanding of why these tunnels were dug so deep. The tour and exploration of the tunnels is not a lengthy one, taking around an hour from the start of the video to sitting down with the guide and eating some fresh tapioca at the completion of it. On completion of the tour, the trail takes you past these examples of some scary looking traps used in the tunnels to capture their enemy. We took advantage of our decision to get here early and the lack of crowds to stay a bit longer and eat lunch at the restaurant down on the Saigon River. It was another example of good Vietnamese food that doesn’t break the budget. All of this food including two beers cost AUD$14. I couldn’t get two beers for that at home! If you have little time or hanging out with the locals isn’t your style then I wouldn’t suggest catching the local buses. Instead, make a booking with a tour company, there’s plenty of them to choose from. Catching the bus meant we did this on our own timetable and weren’t forced into mandatory rest stops by tour operators. Go early in the day, before it gets too hot and to reduce the impact of crowds that swell later in the day during high season. If you want to get into the small tunnels I suggest wearing dark colours as the entrances are very small and often surrounded with mud and foliage. Take water. Whilst the distances to walk aren’t lengthy, this is the jungle. It’s hot and humid. If you haven’t brought any with you there is a shop where the bus drops you off or a cafe on site. Take insect repellent. Again, this is the jungle and there were mosquitoes around when we were here. Whilst the tracks are well maintained and reasonably easy to walk, it’s a good idea to wear sensible shoes, particularly in wet weather conditions. Take a poncho or other wet weather protection. If it rains whilst you are on the trails there aren’t too many places to shelter. You won’t want to be waiting out a thunderstorm in one of those tunnels, trust me. Would I recommend the Cu Chi tunnels? In doing my research on Cu Chi tunnels prior to making the decision to go, I read other opinions which are now in contrast to mine. This is only natural. We have made a habit of being involved in learning about war history wherever we have travelled, so we were happy to make it a part of our itinerary. However, whilst I am quite sure I would have been happy at the Ben Dinh tunnels, I was extremely pleased we came to Ben Duoc. Fewer crowds and less of a tourist focus gave us more time to spend here, and therefore more time to think about and absorb what had occurred in this area. Our guide did not rush us at all and he was happy to wait for some to get through the tunnels and equally happy to not pressure those who weren’t comfortable into going underground. Oh and that video continues to stay in my thoughts, pushing me to think more about the events of that war. It’s a long and tiring day, especially if you catch the local buses, but I am ever so pleased we went there. Where else in the world can you actually see such an incredible piece of world history that has been so well preserved? A very very interesting read, I’m so glad you shared this. I totally understand why they widened the tunnels at Ben Dinh, makes sense to this not so skinny Ausssie. But like you I would have chosen to see tunnels still in their original form. Though I must admit the thought of going into one makes me very jittery, I don’t like small spaces. I think the great thing is that you can get into the little tunnels (if you fit) but then you can still get the experience in the bigger ones. Woah…what an interesting find.Have to go to Vietnam. The actual tunnels, the traps, and the food!!! The booby traps alone make it worth the price of admission 😉 I recall seeing US artillery in Hue, all around the Imperial City, really. Haunting and amazing images reminding us of the past. And we got a WAY different version of how things transpired, in Northern Vietnam versus Southern Vietnam 🙂 Awesome post. Thanks Ryan. As an Australian, I’ve definitely got a much different view too and I can only imagine the American view ! Hue was quite close to the 17th parallel and the DMZ which is all very key to this war. Thanks so much for your comments. I enjoyed doing this while in Vietnam as well! I liked the fact that it was less crowded as well. An outline of how to get here via busses would be useful! It’s my next article Anna! Whoa! What an exciting thing to do! Crouching through tunnels. I did go through some tunnels in forts of India and those are nothing compared to this. I would love to experience this some day. Getting into the tunnel is the most funniest part. This would have been a great adventure. Revisiting historic places always gives me goosebumps. The ingenuity of the Vietcong is quite amazing. This is somewhere that I would love to visit! Looks like a great day out! They were incredibly clever, if not devious, but I guess that’s war. Wow. The holes are so tiny! Very cool. The restaurant food looks great, what were the dishes? Can’t wait to hear about the bus ride! I’m sure it was very colorful. What an interesting experience! It would definitely be harrowing to think about all the events that took place in this area, but I think learning more about these events is important. Those tunnels look insane–I can’t believe how small that entrance is! I would love to visit Ben Duoc, even though I might get a bit claustrophobic, lol! This is amazing to see. I just finished reading The Things They Carried with a student about the Vietnam war. I’m more of a Make Love, Not War kinda girl, but learning about the past helps build a true respect for the men who served for our country. It’s important to remember our history and how it has impacted the world. Agree on all counts Stephanie. I so agree with the catching the local buses! I find that I like to rush through certain places but take my time at others (obviously to try and get the perfect IG photo haha) so I like to go at my own pace. Anyways, I have some family members who fought in the war there so it would be an interesting experience to visit one day for sure! I really wanted to see the Cu Chi Tunnels when I was in HCMC, but I just didn’t have time. There are always two things that draw me to a place (and sometimes it’s a combination) either some really captivating photo or moment in history. Vietnam for me was the photos, but I knew I should study up more on its history before going, especially as an American, and it quickly became about understanding the country. Cu Chi Tunnels is top of my list when I return! the war history was high on our list being Aussies, so we made it happen. Hopefully you will get there next time. I would definitely recommend visiting the Cu Chi tunnels. I do like the photos in your post as they illustrate the tunnels perfectly. I would definitely not recommend them for anyone who is claustrophobic though. I’m so glad you ended up choosing the right tour for you! I think I would have been terrified. Those tight squeezes would have made the fat girl inside me scream and run away. Said fat girl also would have loved the food and the view of the river, so I guess there’s something for everyone! you are a classic Kate – there are other tunnels for you too I’m sure. Food was terrific. Sounds like it’s definitely a place for history lovers who are interested in the Vietnam War. it amazes me how intelligent and immense the network of connecting underground tunnels is … and amazing that so many thousands of fighters and villages could hide here!! What an interesting place! I find visiting any kind of location where war is referenced difficult, but fascinating to see it from another point of view that you didn’t expect! Important to see though. This tunnel is very interesting to explore and i have never seen or been to anything like this before. The rest of the places around are great as well. This is something I would like to see. I find myself in a lot of tourist traps but I love history. The good and the bad make what the world is today.It is a somber visit usually to some of these places, but educational. Great post and very true, these are not to be missed, i had great fun in the holes and playing around like a kid ?. I loved Vietnam. I’m heading to Vietnam next year so will pin this for later! I would be a bit worried about trying to fit myself through that tiny entrance into the tunnels though! Looks like a great day out! Thanks Jess, it was an awesome experience. thanks Emily, really appreciate that. It is insane how small that tunnel entrance is…I imagine not all tour-goers get to see the inside? correct Brianna, only small people can fit in. Oh the picture in the hole just scares me to death! 😉 What a riot. I have not traveled anywhere in the world like this so it all seems so…well…foreign. 😉 Great post. I need to explore more of the world. Haha yes it definitely puts you in an “oh my god” frame of mind. Great tip about the local buses. They are a great way to save money and experience life like a local but they will take FOREVER to get from A to B.
I know very, very little about Vietnam, and have never heard of this. It definitely sounds like something to do that’s off the beaten path. Thanks for sharing! Oh no, we’ve actually missed it! Such a shame, always a good reason to return. How timely was this post! We are off to Vietnam today! I am interested in doing the tunnels ourselves so this is very helpful. I have been 10 years ago and remember not being a huge fan of those small tunnels – but I really want to share with my family. I am going to read your next post re the buses. Hope you have a fantastic time Melissa, Vietnam is such a wonderful place. Hope you get back out to Cuchi. I don’t think I could get myself to go in those tunnels. What a tight fit! We were in Vietnam this summer as well and visited some war museums. I’m Canadian so I didn’t learn much about the war in school but it was really odd hearing it refereed to so differently than what I had heard from American media. Oh my! Just seeing the slideshow gave me a bit of anxiety. I don’t know if I could do the underground part. I love history (teach it to middle schoolers) so I know I would love that part of it. Pinned this! It’s not for everyone Carmen ! But there’s so much to learn and see without going under. Thanks Anna, I am sure you would enjoy the experience too. Rhiannon thank you so much! I really appreciated reading your response and whilst I don’t find that surprising at all, it was good to know. I love travelling to new places because I do exactly what you have just said – research and read. I have bee to the Cu Chi tunnels and was very interesting and scary thinking about what people went through during the Vietnam War. Great photos. Quite an amazing place. Would love to check it out one day! Awesome details on this post. Thanks. Wow! What an interesting post. I never even knew about this place and the narrow tunnels are so interesting. Would love to visit now.. This is by far the most informative article I’ve read about Cu Chi Tunnels. Thank you!!! Thanks so much Carl, I know I hard to really hunt around to find info when we wanted to go. Pleased you found it useful.